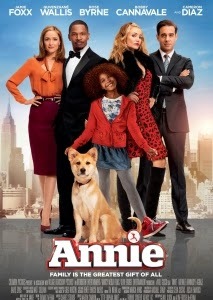 Not even the promise of sunshine can save the one-note exercise in musical adaptations that is Annie (2014). Helmed by Will Gluck (of Easy A (2010) notoriety), this adaptation of the 1977 Broadway musical delivers on sights and sounds, but sadly, there is little meat on these bones. Screenwriter Aline Brosh McKenna and Gluck have updated not only to a modern New York City, but they have also tweaked the plot to near fallibility. Most noticeable is a more racially diverse cast, a musical score that has been sufficiently urbanized and a more whip-smart yet oh-so-doe-eyed Annie (Quvenzhané Wallis). Annie lives in foster care rather than a bustling orphanage and with only a few girls to keep her company. Colleen Hannigan (Cameron Diaz) is still in charge and is decidedly less diabolical and considerably more delirious. Annie’s luck changes when she is saved from near-death by Will Stacks (Jamie Foxx), a self-made millionaire whose mayoral campaign is flagging. Stacks’ campaign manager, Guy (Bobby Cannavale), who sees his candidate taking Annie into his home as an instant ratings boost. What ensues is the classic story we know so well: Annie making her way deep into the hearts of those she meets and overcoming her own dire straits with the power of positivity. While this incarnation is effervescent enough to wash away your blues, there is something hollow here. The main issue is the script: puerile dialogue inspires overblown acting and hampers any potential enjoyment. Performances lie in extremes, but not believable or even palatable enough to pull off an onscreen musical. At one end, you find Stacks and Grace (Rose Byrne) as more grounded. Foxx and Byrne delivers surprisingly adept turns at song and dance. Less palatable are moments are when Diaz and Cannavale arrive. Diaz is doing her best Carol Burnett impression and, even then, its still not that pleasant to watch. All bravado and screeching, Diaz’s Hannigan stumbles around in a booze-fueled haze but lacks bite. Wallis’ take on Annie translates as twee but resilient, and still a bit green around the gills. There are moments when not even her eagerness can save her from overacting. The music of this Annie is catchier than the original but the fact that the majority of this cast is not known for their singing chops dulls the shine a bit. It’s easy to tap your foot as you listen to tunes that have been embedded into the cultural bedrock for so long: “It’s the Hard Knock Life” is still the shiniest song here. A nice addition is an original song penned by Sia, “Opportunity”, which allows Wallis to showcase her vocal stylings to their full brightness. As far as holiday films go this is perfect for lightening the holiday hangover but ultimately it’s equal parts onerous and energetic, overreaching in its attempt not buckle under the weight of previous iterations. It appears as if this latest version of Annie is destined to merely become a liner note in its eponymous saga, but it goes down merrily.